Within a few decades, astronomers will become “know-it-alls”. Literally. “But there is a ‘cosmic horizon’, a physical limit to what we can see,” she said. Dr Davis leads the “Dark Universe” theme of the Australian Research Council Centre of Excellence for All-sky Astrophysics. 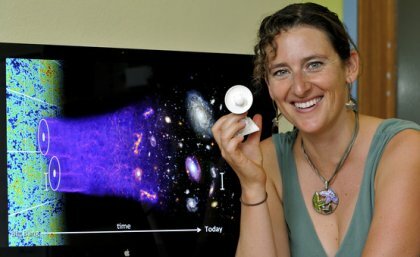 She will speak about the limits of the observable Universe at ‘The Edges of Astronomy’ conference being run by the Australian Academy of Science at the Shine Dome in Canberra today and tomorrow. “The next few generations of telescopes will be able to survey almost the entire volume of the Universe, in all directions, all the way back to almost the beginning of time,” Dr Davis said. However, Dr Davis adds, even if astronomers can see things happening, “that doesn’t mean that we understand them”. “For instance, we can see galaxies forming, but we still don’t understand all of the laws of physics that make that happen,” she said. Associate Professor Davis leads projects tackling two of the big unknowns in cosmology: dark matter (which holds galaxies together), and dark energy (which makes the expansion of the universe speed up). Dr Davis is author of more than 60 publications, including two Naturepapers and 10 papers with more than 100 citations, making her one of the world’s most highly cited astrophysicists, ranking in the top one per cent. In her conference session, Dr Davis will be joined by three other astrophysicists who will discuss how far back in time we can see, the limits due to the smallest scales we can see, and the fundamental limits to knowledge. Edges of Astronomy is the latest in the Australian Academy of Science’s Frontiers of Science series which brings the best young Australian scientists together with leaders in their fields. This year the expert group will explore the potential economic benefits of astronomy, its technological spinoffs (such as WiFi), career development and astronomy’s impact on the public awareness of science.